Mouse anti Rabbit CD8 antibody, clone 12.C7 (MCA1576GA) used for the evaluation of CD8 expression on cells from lymph nodes and spleen from rabbits infected with alcelaphine herpesvirus 1 by flow cytometry. Analysis of in vivo BrdU incorporation. Rabbits were treated as described in Fig. 1. PBMCs were collected at days 11, 15, 17, 20 and 24 post-inoculation, while mononuclear cells were isolated from popliteal lymph node and spleen at the time of death. Cells were labelled with anti-CD11b, IgM, CD5, CD4 and CD8 mAbs as the primary antibodies. Alexa 633-GAM was used as the secondary antibody. In vivo BrdU incorporation was revealed by immunofluorescent staining as described in Methods. After staining, cells were analysed by flow cytometry. A. Representative flow cytometry dot plots are shown for each double staining, they illustrate the data obtained at day 17 post-infection for the PBMC of rabbits MR17/1 and IR17/1. The data represent the percentages of BrdU positive cells (y-axis) calculated based on the acquisition of 10,000 cells expressing the indicated cell marker (x-axis). B. The percentage of BrdU positive cells amongst the indicated cellular subset was determined and compared between AlHV-1 infected (left column: bold lines; middle and right columns: hatched bars) and mock infected (left column: dotted lines; middle and right columns: open bars) groups (* P<0.05; **P<0.005, *** P<0.0001). In the left column the following symbols were used: small closed triangle, MR17/1 and IR17/1; small open square, MR17/2 and IR17/2; small closed circle, MR20 and IR20; large open circle, MR24 and IR24. From: Dewals B, Boudry C, Farnir F, Drion P-V, Vanderplasschen A (2008) Malignant Catarrhal Fever Induced by Alcelaphine herpesvirus 1 Is Associated with Proliferation of CD8+ T Cells Supporting a Latent Infection. PLoS ONE 3(2): e1627. 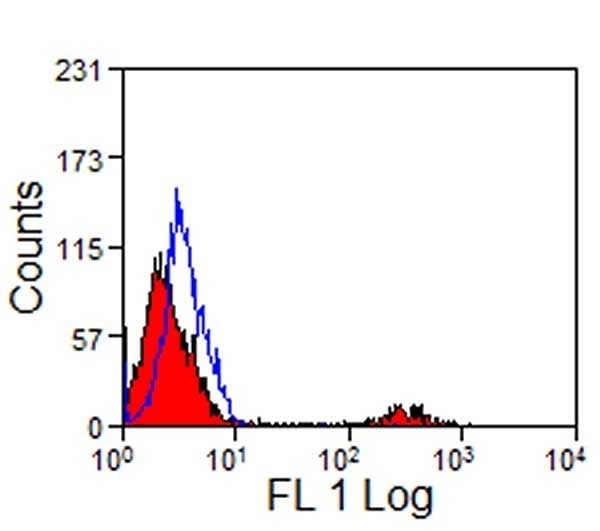 Mouse anti Rabbit CD8 antibody, clone 12.C7 recognizes the rabbit CD8 cell surface antigen, expressed by a subset of T lymphocytes with cytotoxic/suppressor activity. De Smet, W. et al. (1983) Rabbit leukocyte surface antigens defined by monoclonal antibodies. Eur J Immunol. 13: 919-28. Dewals, B. et al. 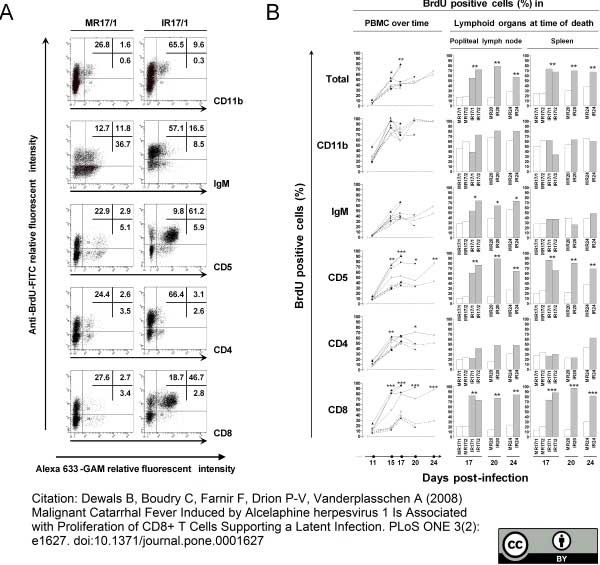 (2008) Malignant catarrhal fever induced by alcelaphine herpesvirus 1 is associated with proliferation of CD8+ T cells supporting a latent infection. Zhao, L. et al. (2011) Evaluation of immunocompatibility of tissue-engineered periosteum. Wilkinson, J.M. et al. (1992) A cytotoxic rabbit T-cell line infected with a gamma-herpes virus which expresses CD8 and class II antigens. Marques, R.M. et al. (2012) Early inflammatory response of young rabbits attending natural resistance to calicivirus (RHDV) infection. Vet Immunol Immunopathol. 150: 181-8. Schock, A. and Reid, H.W. (1996) Characterisation of the lymphoproliferation in rabbits experimentally affected with malignant catarrhal fever. Beghelli, D. et al. (2012) Phytoderivates in Rabbit Diet and Immune responses. Khan AA et al. (2015) Therapeutic immunization with a mixture of herpes simplex virus 1 glycoprotein D-derived “asymptomatic” human CD8+ T-cell epitopes decreases spontaneous ocular shedding in latently infected HLA transgenic rabbits: association with low frequency of local PD-1+ TIM-3+ CD8+ exhausted T cells. J Virol. 89 (13): 6619-32. Srivastava, R. et al. (2015) A Herpes Simplex Virus Type 1 Human Asymptomatic CD8+ T-Cell Epitopes-Based Vaccine Protects Against Ocular Herpes in a "Humanized" HLA Transgenic Rabbit Model. Invest Ophthalmol Vis Sci. 56 (6): 4013-28. Hanson, N.B. & Lanning, D.K. (2008) Microbial induction of B and T cell areas in rabbit appendix. Dev Comp Immunol. 32 (8): 980-91. Waclavicek, M. et al. (2009) Analysis of the early response to TSST-1 reveals Vbeta-unrestricted extravasation, compartmentalization of the response, and unresponsiveness but not anergy to TSST-1. J Leukoc Biol. 85 (1): 44-54. Dewals, B. et al. (2011) Ex vivo bioluminescence detection of alcelaphine herpesvirus 1 infection during malignant catarrhal fever. J Virol. 85 (14): 6941-54. Anderson, I.E. et al. (2008) Production and utilization of interleukin-15 in malignant catarrhal fever. J Comp Pathol. 138 (2-3): 131-44. Stich N et al. (2010) Staphylococcal superantigen (TSST-1) mutant analysis reveals that t cell activation is required for biological effects in the rabbit including the cytokine storm. Toxins (Basel). 2 (9): 2272-88. Myster, F. et al. (2015) Viral semaphorin inhibits dendritic cell phagocytosis and migration but is not essential for gammaherpesvirus-induced lymphoproliferation in malignant catarrhal fever. J Virol. 89 (7): 3630-47. Srivastava, R. et al. (2016) The Herpes Simplex Virus Latency-Associated Transcript Gene Is Associated with a Broader Repertoire of Virus-Specific Exhausted CD8+ T Cells Retained within the Trigeminal Ganglia of Latently Infected HLA Transgenic Rabbits. J Virol. 90 (8): 3913-28. Gates, K.V. & Griffiths, L.G. (2018) Chronic graft-specific cell-mediated immune response toward candidate xenogeneic biomaterial. Immunol Res. 66 (2): 288-98.